Pages 14, 36-37, 69-70, 203, 281-282. Amoung Hawai'i's Palm Groves, Coral Reefs and Volcanoes..
John Murray, London, 1875, 1881. While she makes it clear throughout the book that she intensively reads works applicable to her travels, it is usually clear when information is introduced from a secondary source. Arriving at Honolulu in January 1873, she visited several Hawaii islands for a six month period and her observations are a snapshot of Hawaiian society at the time. This contrasts with some accounts that are probably based on, occassionally distant, recollections. Dela Vega (ed, 2004) notes the surfriding references in Bird as pages 67, 203 and 281-282. 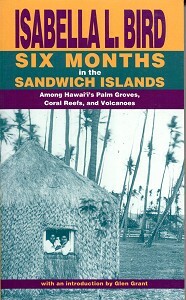 I am unable to locate specific detail page 67, apart from the translation of several Hawaiian terms relating to water. Hawaiian Hotel, Honolulu 26 January 1873. We were just outside the reef, and near enough to hear that deep sound of the surf which, through the ever serene summer years girdles the Hawaiian Islands with perpetual thunder, before the pilot glided alongside, bringing the news which Mark Twain had prepared us to receive with interest, that "Prince Bill" had been unanimously elected to the throne. The surf ran white and pure over the environing coral reef, and as we passed through the narrow channel, we almost saw the coral forests deep down under the Nevada's keel; the coral fishers plied their graceful trade; canoes with outriggers rode the combers, and glided with inconceivable rapidity round our ship; amphibious brown beings sported in the transparent waves; and within the reef lay a calm surface of water of a wonderful blue, entered by a narrow, intricate passage of the deepest indigo. This is the paradise of Hawaii. What Honolulu attempts to be, Hilo is without effort. Its crescent-shaped bay, said to be the most beautiful in the Pacific, is a semi-circle of about two miles, with its farther extremity formed by Cocoanut Island, a black lava islet on which this palm attains great perfection, and beyond it again a fringe of cocoanuts marks the deep indentations of the shore. From this island to the north point of the bay there is a band of golden sand on which the roar of the surf sounded thunderous and drowsy as it mingled with the music of the living waters of the Waiakea and the Wailuku, which after lashing the sides of the mountains which give them birth, glide deep and fern-fringed into the ocean. Canoes came off from the shore, dusky swimmers glided through the waters, youths, athletes, like the bronzes of the Naples Museum, rode the waves on their surf-boards, brilliantly dressed riders galloped along the sands, and came trooping down the bridle-paths from all the vicinity till a many-coloured, tropical crowd had assembled at the landing. I had written thus far when Mr. Severance came in to say that a grand display of the national sport of surf-bathing was going on, and a large party of us went down to the beach for two hours to enjoy it. It is really a most exciting pastime, and in a rough sea requires immense nerve. The surf-board is a tough plank shaped like a coffin lid, about two feet broad, and from six to nine feet long, well oiled and cared for. It is usually made of the erythrina, or the breadfruit tree. The surf was very heavy and favourable, and legions of natives were swimming and splashing in the sea, though not more than forty had their Papa-he-nalu, or "wave sliding boards," with them. The men, dressed only in 'malos', carrying their boards under their arms, waded out from some rocks on which the sea was breaking, and, pushing their boards before them, swam out to the first line of breakers, and then diving down were seen no more till they re-appeared as a number of black heads bobbing about like corks in smooth water half a mile from shore. What they seek is a very high roller, on the top of which they leap from behind, lying face downwards on their boards. As the wave speeds on, and the bottom strikes the ground, the top breaks into a huge comber. The swimmers appeared posing themselves on its highest edge by dexterous movements of their hands and feet, keeping just at the top of the curl, but always apparently coming down hill with a slanting motion. So they rode in majestically, always just ahead of the breaker, carried shorewards by its mighty impulse at the rate of forty miles an hour, yet seeming to have a volition of their own, as the more daring riders knelt and even stood on their surf-boards, waving their arms and uttering exultant cries. They were always apparently on the verge of engulfment by the fierce breaker whose towering white crest was ever above and just behind them, but when one expected to see them dashed to pieces, they either waded quietly ashore, or sliding off their boards, dived under the surf, taking advantage of the undertow, and were next seen far out at sea preparing for fresh exploits. The great art seems to be to mount the roller precisely at the right time, and to keep exactly on its curl just before it breaks. Two or three athletes, who stood erect on their boards as they swept exultingly shorewards, were received with ringing cheers by the crowd. Many of the less expert failed to throw themselves on the crest, and slid back into smooth water, or were caught in the combers, which were fully ten feet high, and after being rolled over and over, ignominiously disappeared amidst roars of laughter, and shouts from the shore. At first I held my breath in terror, thinking the creatures were smothered or dashed to pieces, and then in a few seconds I saw the dark heads of the objects of my anxiety bobbing about behind the rollers waiting for another chance. The shore was thronged with spectators, and the presence of the elite of Hilo stimulated the swimmers to wonderful exploits. These people are truly amphibious. Both sexes seem to swim by nature, and the children riot in the waves from their infancy. They dive apparently by a mere effort of the will In the deep basin of the Wailuku River, a little below the Falls, the maidens swim, float, and dive with garlimds of flowers round their heads and throats. The more furious and agitated the water is, the greater the excitement, and the love of these watery exploits is not confined to the young. I saw great fat men with their hair streaked with grey, balancing themselves on their narrow surf-boards, and riding the surges shorewards with as much enjoyment as if they were in their first youth. I enjoyed the afternoon thoroughly. Then there are her eldest son, a bachelor, two widowed daughters with six children between them, three of whom are grown up young men, and a tutor, a young Prussian officer, who was on Maximilian's staff up to the time of the Queretaro disaster, and is still suffering from Mexican barbarities. The remaining daughter is married to a Norwegian gentleman, who owns and resides on the next property. So the family is together, and the property is large enough to give scope to the grandchildren as they require it. The young people all speak Hawaiian as easily as English, and the three young men, who are superb young fellows, about six feet high, not only emulate the natives in feats of horsemanship, such as throwing the lasso, and picking up a coin while going at full gallop, but are surf-board riders, an art which it has been said to be impossible for foreigners to acquire. But the more I see of them the more impressed I am with their carelessness and love of pleasure, their lack of ambition and a sense of responsibility, and the time which they spend in doing nothing but talking and singing as they bask in the sun, though spasmodically and under excitement they are capable of tremendous exertions in canoeing, surfriding, and lassoing cattle. During this time, on November 7, 1837, one of the striking phenomena which make the islands remarkable occurred. The crescent sand-beach, said to be the most beautiful in the Pacific, the fringe of palms, the far-reaching groves behind, and the great ocean, slept in summer calm, as they sleep to-day. Four sermons, as usual, had been preached to audiences of 6000 people. There had been a funeral, the natives say, though Mr, C. does not remember it, and his text had been "Be ye also ready," and larger throngs than usual had followed the preachers to their homes. The fatiguing day was over, the natives were singing hymns in the still evening air, and Mr. C. "had gathered his family for prayers" in the very room in which he told me this story, when they were startled by" a sound as if a heavy mountain had fallen on the beach." There was at once a fearful cry, wailing, and indescribable confusion. The quiet ocean had risen in a moment in a gigantic wave, which, rushing in with the speed of a racehorse, and uplifting itself over the shore, swept everything Into promISCUOUS ruin; lllen, women, children, dogs, houses, food, canoes, clothing, floated wildly on the flood, and hundreds of people were struggling among the billows in the midst of their earthly all. Some were dashed on the shore, some were saved by friends who hurried to their aid, some were carried out to sea by the retiring water, and some stout swimmers sank exhausted; yet the loss of life was not nearly so great as it would have been smong a less amphibious people. Mr. C. described the roaring of the ocean, the cries of distress, the shrieks of the perishing, the frantic rush of hundreds to the shore, an'l the desolation of the whole neighbourhood of the beach, as forming a scene of the most thrilling and awful interest. Pages 14, 69-70, 203, 281-282. Rendered into HTML on Sunday January 4 14:18:51 CST 2004, by Steve Thomas for The University of Adelaide Library Electronic Texts Collection.